Our mind takes us into a world of fantasy as "The Black Stallion" rides into our imagination. We visualize ourselves with such a noble beast and rationalize our emotions to bring this vision to a reality. With a little shake of the head, the Hollywood script falls out of our mind's cluttered cupboard of childhood dreams, awakening us to our mature senses that such an embracing trust between human and stallion is best left on the big screen. Oh, but wouldn't it be something to have such a handsome creature parading our paddocks in such perfect harmony. There are numerous backyard breeders throughout the province who are somewhat living the dream. For others, it's that cute little colt their mare had last spring that just might make a good breeding prospect. In most cases, common sense prevails and the colt is gelded before too long. Owning and breeding a stallion requires commitment, time and discipline. It is a serious business and a lot of thought and preparation should go into one's consideration of such a venture. Entertaining this notion of owning a stallion should be followed up by asking yourself a few questions. Do you have the proper facility to house a stallion? Do you have the experience and skill in handling a breeding animal? Do you have the ability to evaluate a mare's cycle? The life of a stallion is not glamorous and can be very lonely in isolation. Most colts are better off as geldings, granting them the freedom to socialize in their domesticated world and avoid the trap of stable vices so often manifested in confined stallions. 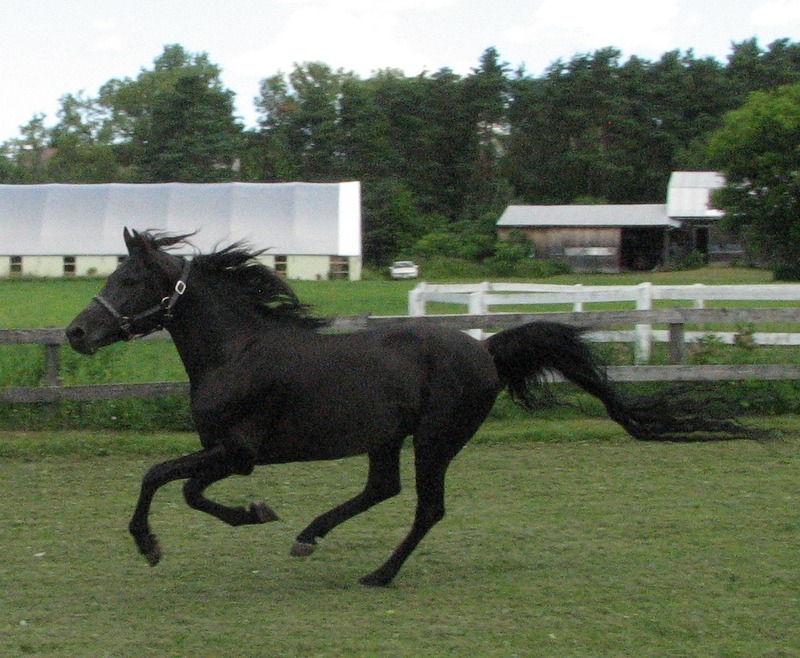 If you are involved in the pleasure or show arena, a breeding stallion's disposition should reflect that environment. Hot, doesn't necessarily mean unmanageable or difficult. Pleasure should be just that - an enjoyable personality. Therefore, first and foremost should be its temperament. Even if you have a very handsome and correct colt, if it is unpredictable, aggressive or even flighty and worrisome, it will be no picnic for you as its caretaker. Many a time, the responsible breeder will critically evaluate a colt and geld it if all things are not equal. Just remember that it takes a good stallion to make a great gelding! Whenever selecting an individual for a breeding program, you have a heavy responsibility to the breed you have chosen to help perpetuate through your efforts. All breeders should strive to produce the best they can and to ensure that the breed and, just as important, its characteristics, are protected for future generations with structurally sound foundations. Just deciding it would be nice to have a foal or two to raise or possibly sell, does not constitute a conscientious stallion or mare owner. It runs deeper than that. The education and handling of stallions begins at birth. Although stallions should be treated no differently than any other horse, certain precautions are necessary. That cute bouncing baby boy on the end of a lead shank should not go unchecked. Too often people make the mistake of not recognizing and correcting a potential problem when it first begins, even in, and especially during the baby phase. The playful rearing and mock battles can result in a serious blow to humans later on. Those love nips could eventually tear or break an arm. This saucy adolescent behaviour must be corrected immediately, before it becomes a serious threat to safety. The testing colt must be taught what is acceptable behaviour and what is not. This doesn't mean beating him senselessly, but it does mean being immediate and consistent without compromise in punishment. It is in your own interest to take charge of the situation. You are not its playmate. You are its partner. You must ultimately earn and demand respect from this mature 1,000 lbs. plus equine. The act of breeding stallions is not solely a job designated to men. On the contrary, more and more women are handling stallions than ever before. Brains more than brawn is required in the breeding shed. The brawn part can be adequately managed with restraint training and appropriate apparatus. The job of the stud handler requires common sense and alertness, accompanied with a calm, take-charge attitude in these situations. In fact, the one holding the end of the lead shank in their hand becomes the herd leader or dominant influence. In most cases, handling the mare can be more challenging. I personally make it a point to know my stallions' character and manner and to have their total respect and undivided attention. If you are at all intimidated by a stallion's physique and strength, then I suggest that you leave the business of handling the stud to someone else. There is no room for fear or second guessing when working with stallions. Even the most mild mannered stallion can become a Jeckle and Hyde in the breeding shed. Hormones are nature's strong motivator, so maintaining absolute control of the situation and environment is paramount. A stallion should not on the other hand be totally stalled and only brought out for the occasional stud duties. They are not just breeding machines. They possess the same basic needs as their gelded brethren. A stallion requires companionship and plenty of exercise to keep him both happy and fit. For instance, in our own breeding program, our stallions are used for either show or recreational purposes. They are ridden and/or driven alone, and in the company of others. They have been taught to work amicably with their neighbours and to display good manners at all times. This is something we insist upon. Stallions are often misunderstood and given bad press. If a stallion is unruly, it is usually the result of poor management, rather than the stallion being labeled as mean spirited. It seems they can either be blessed with what nature has provided, or cursed because of it. A lot of this depends on habitat. Stallions to be bred must be taught a sort of protocol. They are creatures of habit and so a routine devised for breeding purposes should be forged. This usually involves a selected and specific site, as well as maintenance of the stud before and after breeding. The often neglected job by gelding owners concerning sheath cleaning will take on new meaning. Without getting into a lot of technicalities, it is suffice to say for this article that there is a whole host of methods and procedures for hygiene, including mare preparation and pre-breeding rituals that requires knowledge and skill. It is important to remember that many applications are invasive to the horse and must be dealt with using extreme caution. Always choose your handling equipment wisely, such as the quality of the stud chain for instance. Have sufficient length of line to be at a safe distance during breeding. Carry a whip and do whatever you have to in order to keep the situation in your arena, not the stallion's. At all times, the handler should be conscious of the stallion and be prepared to be unyielding and firm if any infractions of the rules occur such as "rushing" or charging a mare. This can have disastrous effects and can be potentially dangerous for everyone. Savaging (the fanatic biting of the mare's neck, flanks, etc.) should not be tolerated. Although it seems simplistic to let nature take its course, there are enormous risks associated with this practise. Serious injuries to both horses could be sustained. Infections could occur if proper maintenance and control of the mare and stallion is not followed. Would you really want to subject your valuable stallion or favourite mare to possible injury or disease? Why not take advantage of all the advancements made in equine reproduction to assist you in having that special package arrive safe and healthy next spring. Stallions by nature have that special personality which sets them apart from their more docile brothers and sisters. Learning to work with the stallion by displaying mutual respect, will result in a problem-free breeding session. Take the time it takes and give him a pat once in a while. Reward him with a kind word during your daily grooming and stable routine. You want him to be a staunch ally and friend who will dutifully obey under all circumstances. Then, perhaps only then, can you allow that mystical "Black Stallion" to be a part of your everyday life at the farm. · This article has appeared in “Horse Talk Magazine” and on numerous world websites. This article from the past has received global rave reviews from New Zealand, all across Canada and the US including other countries where it was read. It remains a poignant reminder.